Few teams have revitalized their franchise this offseason as much as the Reds. They should be commended for starting to spend some money in an environment that is seeing financial restraint as the watchwords for payroll construction. The Reds have a very solid farm system that is headed by what could be their new center fielder, Nick Senzel. He is my 5th ranked prospect. Senzel is a third baseman by experience, but that role belongs to Eugenio Suarez. Second base is taken by Scooter Gennett. That may leave Senzel without a position. It wouldn’t surprise me to see Senzel traded at some point for Corey Kluber of the Indians. For now, however, Senzel heads a very good farm system. 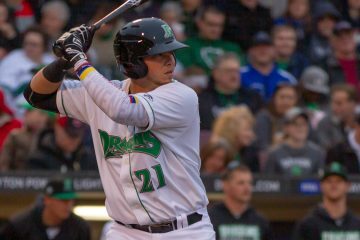 He is joined by very athletic outfielder Taylor Trammell, third baseman Jonathan India, and right-handed pitcher Hunter Greene as players that can add depth to their big league roster at some point soon. Right-handers Tony Santillan and Vladimir Gutierrez are highly regarded as well. Left-handed hitting outfielder Mike Siani has some speed to add. Jose Siri and Mariel Bautista add outfield depth. Catcher Tyler Stephenson is probably the highest rated backstop in the system. There are lots of outfielders in waiting in the Reds system, and that’s why I think they make an excellent in-season trade partner for a team like Cleveland or Baltimore. The comment about Nick Senzel being traded for Corey Kluber is strange. If the Reds were willing to do that, then the trade would have already happened. They weren’t. It hasn’t. It won’t. The system is still deep at the top despite the trades, though it may have rated a tad higher without the trades. But, that’s what depth is for at times. It gives you the ability to make moves to bring in what you need. 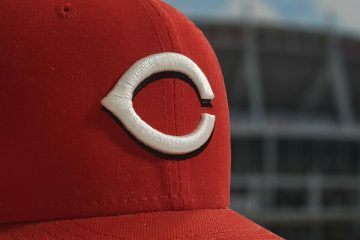 Mark Sheldon of Reds.com took his first guess at the Cincinnati Reds opening day roster earlier today. There’s not any big surprises on his first look at what he believes could be the roster. The biggest one, though, has to be that he has Nick Senzel on it from day one. He lists him as a utility player rather than at any one given position. Sheldon notes that he’s learning center and could play some at third or second, too. 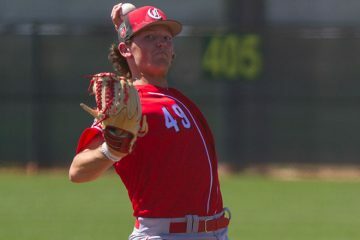 In a perfect world there is no doubt that Nick Senzel would make the Cincinnati Reds roster. He’s one of the best 25 players in the organization. But we don’t live in a perfect world. While it’s nearly impossible to believe that had Senzel remained healthy for all of 2018 that he wouldn’t have been called up, he didn’t remain healthy. His injured finger that required surgery kept him out for the entirety of the second half of the season. Because of the injury and his non-debut last year, it gives the Reds the “leeway” to keep him in the minors for 11 days in order to get an entire extra year of service time at the end of his contract. Essentially, calling him up two weeks into the season instead of from day 1 he would become a free agent after the 2025 season instead of after the 2024 season. This will be a rather interesting decision for the Reds if Senzel plays even remotely decently in center field during the spring. Are they willing to give up that year in order to compete in 2019 immediately? Or will they find a reason to keep him down for a few weeks for 2025? In my eyes, a comment like that suggests that Pleskoff isn’t as high on Senzel as the Reds are and he sees it as just a matter of time before the Reds come around on that, as well. Or perhaps he’s higher on Trammel and doesn’t see the current Reds INF going anywhere. Probably worth noting he’s an Indians fan. Or it sure comes off that way after reading his stuff for the last 5 years. I’m surprised that neither Robert Stephenson nor Matt Wisler made Sheldon’s projected opening day roster. I would expect pitching needy teams to pounce on either if they are DFA. I also expect the Reds to carry 8 relievers vs. 7. There’s room for both if Romano and Senzel are bumped. I know that some will not work out but that is a lot of depth for the bullpen or come up for a few starts. I am curious of what Derrick Johnson can do with this group. Already on Louisville’s roster are: Anthony Bass, Buddy Boshers, Odrisamer Despaigne, Jon Moscot, Felix Jorge (all have some ML experience) plus Juan Martinez, Alex Powers, & Wendolyn Bautista (who have no ML experience). Additionally Ian Krol is signed. That doesn’t count AA piotchers who might be ready for promotion. No surprise on Stephenson or Wisler. Especially Stephenson. He has three mediocre partial seasons with Reds. His MiLB record is decent but MLB hitters are different. Going to be a brutal round of final cuts. Rule 5 kid, Farmer from Puig deal, Cody Reed, Rob Stephenson, Matt Wisler and then of course Senel. I think they try real hard to keep Stephenson and Wisler around. Romano making it over either of those two is a longshot. Oldtimer, while Stephenson has been mediocre at best during his ML time, he has only been used sporadically. He actually looked pretty good in his most extended time which was towards the end of 2017. His AAA results last year were quite impressive. Wisler looked pretty good in the Reds bullpen last season. Neither are sure-fire pitchers, but either could blossom this year. At age 25, I wouldn’t write off either. I think it would take the Orioles, Marlins, or Blue Jays about a nanosecond to claim either. Stephenson was decent in MiLB and mediocre in MLB. 7 years in MiLB and still hasn’t shown himself worthy being been MLB caliber P.
Seven years doesn’t change that he has some of the quality of his pitches is among the best in the organization. Move him to the bullpen (hopefully he was given that word over the offseason) and let him focus on his two best pitches. Even a modest improvement in command and he becomes a “lights out” weapon from the pen. I agree Stephenson has been one of the best AAA performance pitchers Reds have had, and He looked solid at MLB during end of 2017. In 2018, they used him in a choppy manner, he seemed to get a mental block, then got injured. Giving up on Stephenson before mid 2019 would be dumb unless he looks horrible in spring training – and even though spring training isn’t always a good indicator. I think Romano goes to AAA even if he wins a spot during spring training. It’s just hard to say the upside is there to remove someone else from the organization who doesn’t have options. 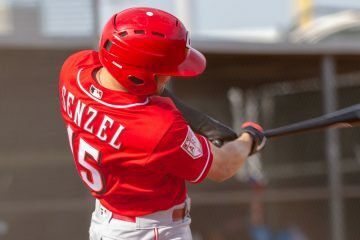 Senzel will be in AAA. It doesn’t make any sense to lose a year of control of our best prospect in a long time. Actually, everyone is assuming that Senzel can handle CF and that he hits well early in 2019. both are not a given, he may spend more time in AAA than people expect. Also, he’s been injury prone and CF wall isn’t going to help that. Reds may keep him in AAA until he has a hot bat and proves himself again, and when there is a roster spot available or someone who isn’t performing. That may be a month or two instead of 11 days. Then the Reds may wait for the super two deadline, somewhere around two months at that point too. Doug, starting to see some veteran free agents signing minor league deals. Do you see anyone left in the market that might be a good fit with the Reds? I don’t see senzel breaking team as a utility player. He’s either starting center or in Louisville. I think they carry an extra bullpen piece instead. Maybe they’ll give it to bobsteve, but I also think reds will be perfectly ok moving on from him. New coaching staff and new pitchers. Out with the old who never cut it. I think Wisler will earn a spot out of camp. Don’t forget Santillan and Vlad are ready for AAA…. Santillan has all of 62.1 IP in AA so far, so I expect he starts the year there, and stays there through at least the MiLB all star break. Assuming he does what we think he can, pitches in the Southern League All Star game and then moves up to AAA, by which time we’ll know who to bump from that rotation which will be a harder question at the start of the year. Joe, what is your definition of not very good and why do you say so? Reds are still projected for a .500 or close to .500 record. I’m going to watch the Spring Training stat lines to see how CIN uses Robert Stephenson. PIT did a wonderful job in transitioning Kyle Crick to an RP and I expect the same for Stephenson. He is out of options and out of opportunities as an SP for CIN. He could transition to an excellent bullpen arm that would involve perhaps as much as 2 years of control before CIN even has to worry about arbitration. That equates to 5 years of control before worrying about free agency. I think Johnson can certainly help Stephenson just like he did with Hader and Jeffress at MIL. Excited to see what happens. Hey Doug, can you just ban this guy? He just shows up to dump on the reds and never actually contributes. He’s one more post like this away from getting banned.